In the EU, China finds an economic partner; in Russia, a strategic ally. How does Beijing balance the two? Chinese Premier Li Keqiang is in Europe this week on a three-country tour that will take him to Germany, Russia, and Italy. The visit to Europe by China’s top economic leader gives insight into China’s balancing act when it comes to the European continent – how to maintain and expand economic relations with powerhouses like Germany while deepening political ties to Russia. Tensions between the EU and Russia have made this two-pronged diplomacy more difficult, but each side offers something China cannot do without. When it comes to the EU, China is most interested in economic opportunities. The travel schedule of Li himself attests to this. As premier, Li is nominally responsible for overseeing China’s economy (although Xi Jinping has taken a more hands-on approach to help push through difficult economic reforms). Li’s foreign travels, then, represent a sort of economic roadmap (or even wish-list) for China. It’s no coincidence that Li’s first tour abroad took him to Germany and Switzerland. He’s been back to Europe several times since, stopping in Romania and Eastern Europe in November 2013 and visiting the U.K. in June 2014. Now Li has once again scheduled EU member states for a trip abroad, further reinforcing the emphasis Beijing places on trade with European partners. This was especially apparent during Li’s time in Germany. A Foreign Ministry briefing held before Li’s departure emphasized Germany’s outsized role in China’s European trade. Trade with Germany alone accounts for close to 30 percent of China’s total trade with the EU member states; the total value of China-Germany bilateral trade in 2013 was $160 billion. As such, Germany provides something of an economic window into the greater EU for China. When it comes to Russia, however, China’s focus is not economic but political. This is evidenced by Li’s own travel schedule – this month’s visit marked his first trip to Russia since assuming power, while Xi Jinping chose Russia as the destination of his first presidential visit abroad. Xi visited Russia again to meet with Putin and celebrate the opening of the 2014 Sochi Olympics. Just as Li’s numerous trips to Europe signal China’s economic interests there, Xi’s (and not Li’s) corresponding focus on Russia indicates a strategic rather than economic interest. That’s not to say that China has no interest in deepening economic cooperation with Russia. Cheng said that the bilateral economic relationship has “huge cooperative potential” – potential that is only slowly unfolding. During his visit, Li and Russian Prime Minister Dmitry Medvedev did sign a number of economic cooperation deals on finance, investment, energy (including nuclear power), and high-speed railways. 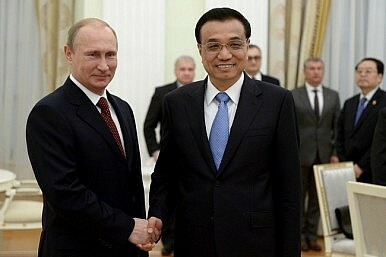 But Beijing clearly values its strategic relationship with Russia more highly than economic ties. Both China and Russia portray their relationship as having bilateral and multilateral facets. On a bilateral level, Beijing and Moscow back each other’s core interests, from Russian control of Crimea to China’s approach to Xinjiang security. On a multilateral level, both countries see their cooperation as helping to advance multi-polar world with truly “democratized” international relations – a quest which will reduce U.S. and EU influence in the current international system. It’s here that the difficulty of China’s balancing act becomes clear. On one hand, it seeks political and strategic partnership with Russia to lessen the global influence of Western countries, including many EU members. But at the same time, China seeks greater economic ties with both the EU as a whole and its individual members, especially Germany. Strategic partnership with Russia cannot bring the increased trade and investment China wants; economic partnership with the EU will not bring the political backing Beijing wants. To achieve both goals, China must balance the two sides of the equation. China’s premier has sought to bolster economies ties with some of Europe’s largest economies.